Broaden the reach of your support organization with the new Bomgar Android Client. Now your employees and end users with popular Android-powered smartphones and tablets can get the assistance they need to be more productive while mobile. Broader Support Reach – Android is the leading mobile device platform in North America. Offer support to Android mobile devices with Bomgar to increase the productivity of your support reps and customer satisfaction of your end users. Reach more remote employees and end users than ever before with your Bomgar-powered support center! •Your support reps will be more productive, remotely resolving issues on Android devices. •Your employees and end users with Android devices will have higher support satisfaction. Flexibility – The Bomgar Android client is now available for all businesses to securely provide end user chat, the ability to transfer files, and view system information. It is also extensible for full remote control, including screen sharing, with the prior approval of the device manufacturer and/or carrier offering the Android device. 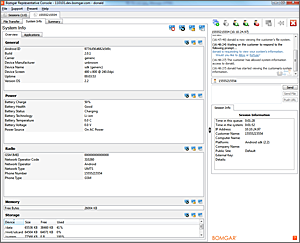 •For Businesses: Any business can use the Bomgar Android Client in their support operation to securely chat, view system information and transfer files to remote employees or end users on Android-powered smartphones and tablets. •For Mobile Device Manufacturers and Carriers: Offers all the capabilities for businesses, plus full remote support capabilities, including screen sharing. The Bomgar Android Client continues Bomgar’s commitment to our customers of a true multi-platform collaborative remote support solution. With Bomgar, your IT support organization can focus on supporting your customer and employee’s support problems, not the environmental variables of an ever-changing mobile device landscape. Additionally Bomgar is committed to fostering open standards and making mobile more manageable. For more flexibility, more security, more collaboration – contact a member of our sales team.